Six buccaneers and a baby. When the salty sea dogs of the Ramshackle spot a makeshift raft sporting an audible and pungent infant, they are aghast. All the more so when they realize that they must find effective ways of feeding and changing the squalling tyke. Yet with a little ingenuity and a goat to give milk, the scalawags are soon enamored of the baby they dub Isla. Good thing too, as an encounter with a scary sea monster proves to be the battleground where a baby pirate can show her true worth. 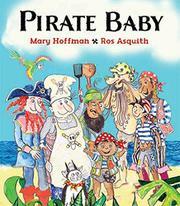 The pirates are a multicultural, softhearted crew, while Isla herself is a brown-skinned charmer. Utilizing a faux naif combination of watercolors and Photoshop, the art is high-energy if a bit slapdash when it comes to matters of scale and size. Alas, the pirates themselves could use a bit of personality, and a brief glimpse of a nearby ship of women pirates may leave readers wishing they could set sail with those wild ladies of the sea instead of this crew. Be sure to look for a number of Briticisms that survived this import’s trip across the ocean intact (example: the baby’s “nappy” emits a strong “pong”) as well as some inspired pirate names (there are “Plunderpuss” the cat, “Crossbones” the doctor, “McSquawk” the parrot, and so on).